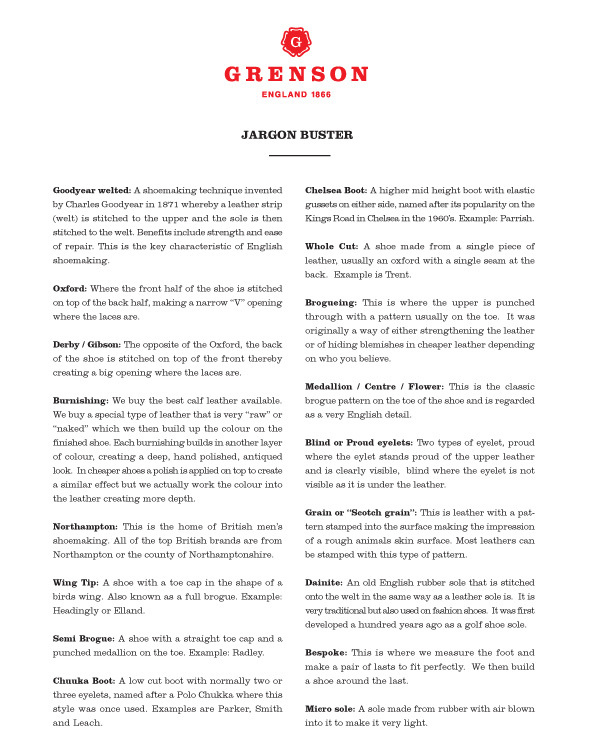 Grenson Jargon Buster | A Continuous Lean. Speaking of shoes, the folks at the storied English maker Grenson have a very handy guide to footwear terminology. So next time you are out shoe shopping you can drop some knowledge on the sales clerk and earn the respect you deserve. It should also be pointed out that the real inventor of the Goodyear Welt was Christian Dancel. Charles Goodyear (heir to the Goodyear tire fortune) mearly bought the rights to Dancel’s machine, which is how the term Goodyear Welt came to be. surprised “blucher” isn’t on there. Grenson’s are truly amazing shoes that are not very common in the US. But they rival some of the more expensive English brands in comfort and style. I have multiple pairs of Grenson’s and I continue to buy because of their fine quality and craftsmanship. Do you own a pair? Nice piece. Have you seen the Duckie Brown collaboration w/ Florsheim? I need the Patriot Boot for my neighborhood 4th of July parade! I have been asked recently what I think of the bicycle toe. I do not find it particularly appealing. Could someone provide a bit of history? Also, for those interested, three pairs from Grenson’s Rushden Range, the Jackson, the Noble, and the Parker, are on sale right now at First Among Equals. Very elegant layout. Back to the days of Ogilvy and Mather. Allen edmonds has a similar guide from an American perspective on their website.